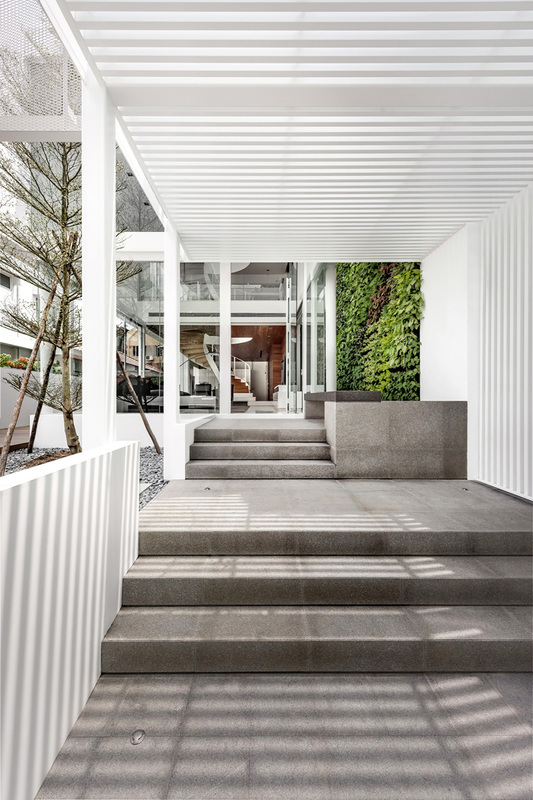 A floating box, a living wall, a sculptural staircase and more! This could be your dream house! House designs can come in so many styles. In truth, there are a lot of ideas one can use to create a house. If we speak of modern homes, sleek lines and geometric shapes are always reflected in them. We have seen that in lists and features we did for Home Design Lover but despite the similarity in concept, each house would always be different from the other because of what the owner wants for it and the difference in location as well. Today, we are going to feature a modern home that boasts a floating box- this is indeed one creative way to use geometry in the house. 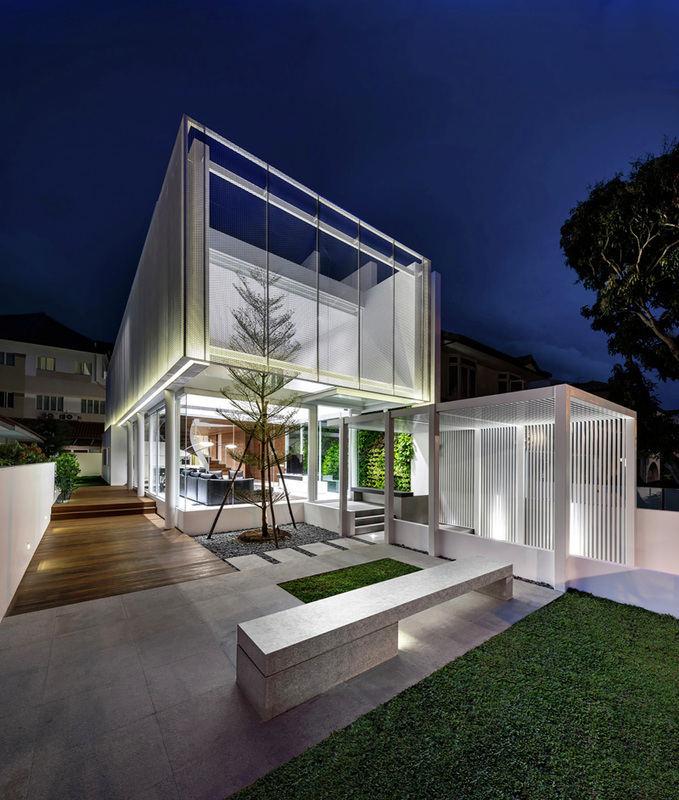 A house nicknamed as “the house out of the floating box” is located in Bedock neighborhood of Singapore. 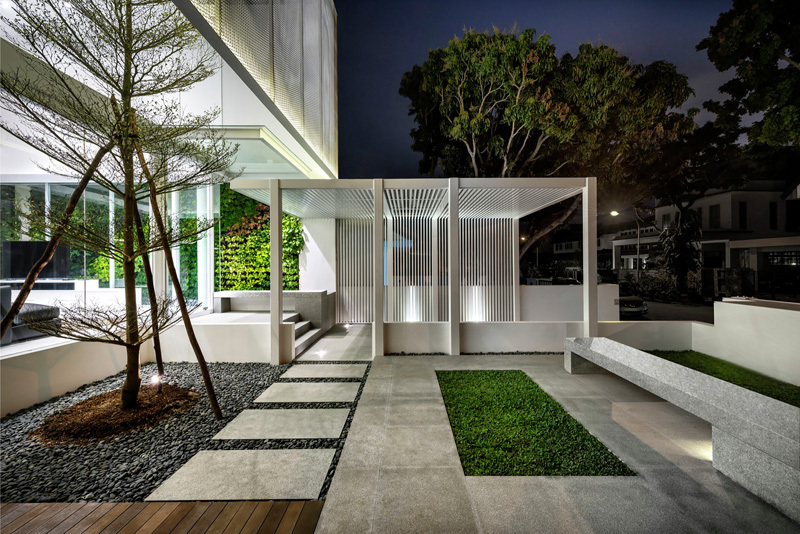 It features a wrapped structure made from convoluted mesh skin that looks like it is perched atop a seamless glass front forming an inviting spatial gesture while one enter the home and walk past the tree canopy of the entrance. Once inside, one could be treated with a double-height living space. You can also see seamless surfaces in the interior that “bring together the best of its surrounding atmosphere by trickling in shades of light, shadows and reflections of its surrounding landscape.” With this, a smooth transition is being reflected into the house where comfort and privacy is being offered in every area. 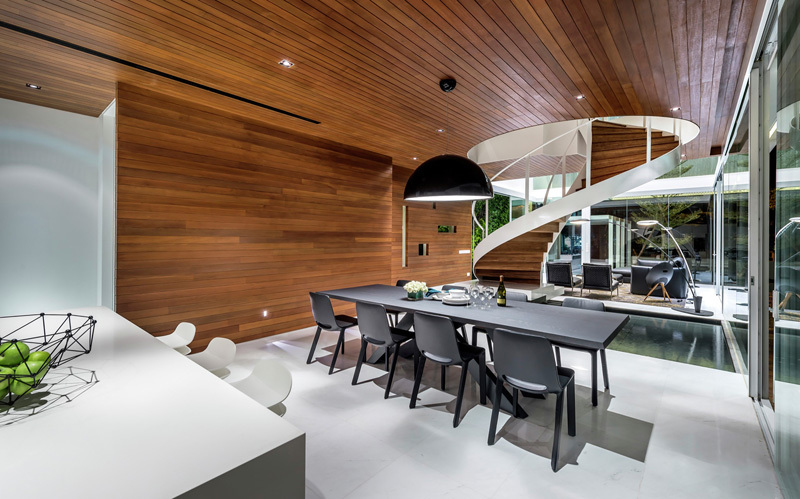 The house has seamless fluidity which is extended vertically wherein all floor level where connected through a beautiful central spiral staircase which is carefully positioned above a water feature. This further complements the home’s concept of a “floating box”, which is carefully designed to be the main focal point of the house as well as the central space for social interaction to the family and guests too. Unique feature: A modern house featuring a floating transparent box above the living room. It has a modern garden that surrounds it with green lawn. 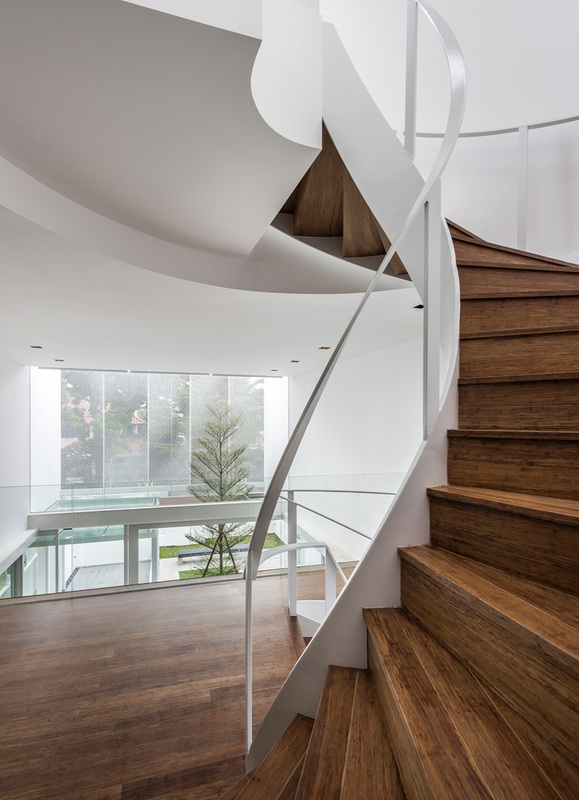 The interior has features a sculptural spiral staircase that will surely draw eyes and admiration. First glance at this house will make you say “wow” because of its very elegant design using sleek lines and geometric shapes. Just above the living room is a floating box. What made it appear floating is the use of glass all around the lower area. Love the landscaping of this modern house too. In the entrance, one will be treated with this beautiful walkway that has a pergola like design. 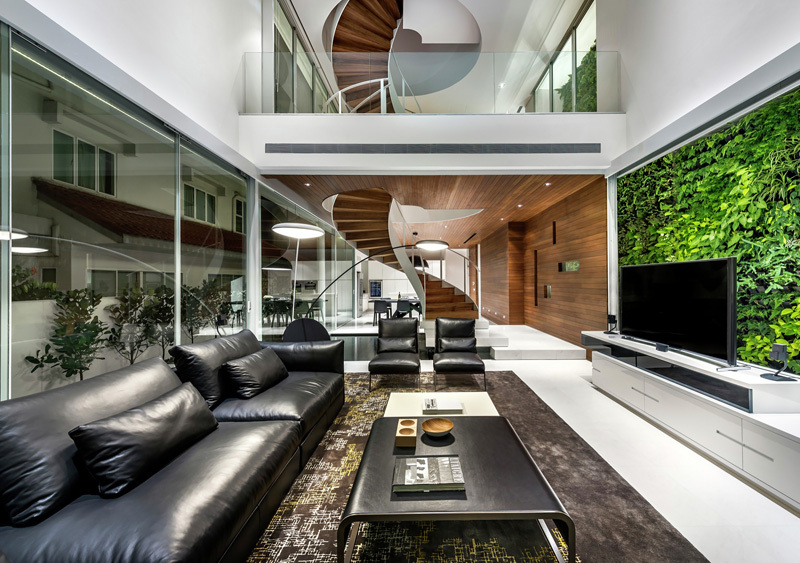 It leads to the interior through concrete steps, right into the glass covered living space. Trees are also seen around the garden too. We mentioned about the steps in the previous entry and we can see that here. Look at one side of the wall! That is the living wall with vertical gardening. It is one feature that I love about this house. Notice also that it used colors white and gray for the exterior. The living wall we saw outside is extended to the living area. Isn’t this very refreshing? Well, it is actually from outside too but because of glass walls, it can be clearly seen in this living room. To maintain its modern look, the living room has black furniture and white console that bears the television. Aside from white, gray and black, you can also see wooden features here especially on the staircase and the ceiling of the upper level. Instead of occupying the entire lower level with ceiling, only the part where the stairs are covered. Beautiful, right? This is the dining area just under the wooden ceiling and a wooden wall on one side. It has a gray dining set with a modern design too. Above the dining set is a black pendant light that adds more visual appeal to the area. In the same space is the kitchen wherein you can see here a white kitchen island. 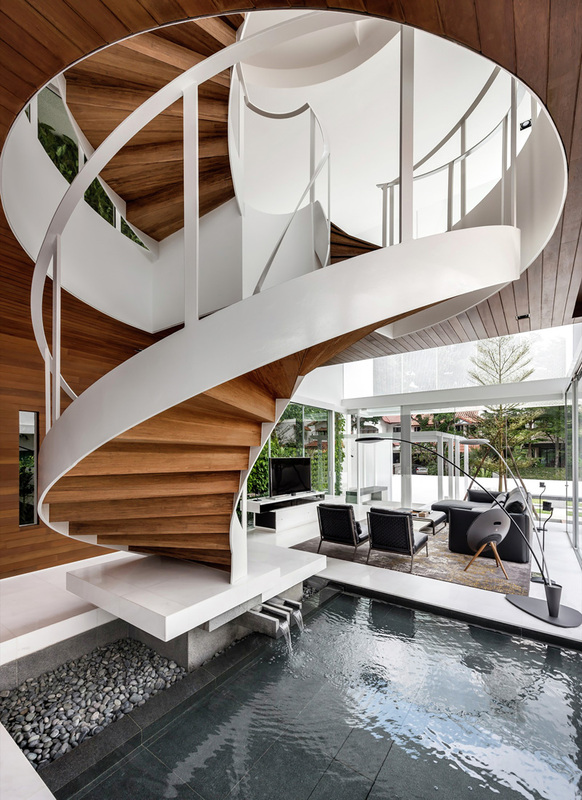 If you were impressed of how the staircase looks like, you will fall in love with it even more since there is a water feature just below it. If we speak of Feng Shui, this one could bring luck to them especially if they add koi fishes in here. 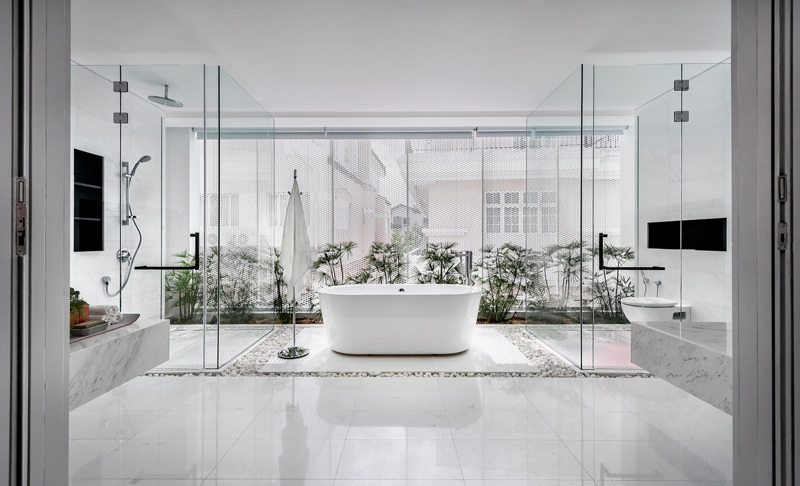 Love the idea of having an indoor water feature like this one! Another look at the staircase at the landing and as it leads to another level. It used wood like what was used on the flooring on this level. It looks really gorgeous with white railings. Once you are on this landing, you can take a glimpse of the living area as well as the beautiful landscaping outdoors. Private spaces are seen on the upper level. It included a bedroom and a bathroom. What we can see here is a bathroom which is very spacious. It looks even more spacious as it used glass on it. This area is actually located inside the floating box. Notice that there are also plants here which made it even more refreshing. And yes, there are stones on the floor too! Isn’t this a stunning modern home? It sure is! Even if we didn’t get to see plenty of photos, we are already given a hint that this house is indeed something unique and very impressive. As usual,Park + Associates never failed us. Like their other home designs, this one has that stunning modern appeal too that is perfectly designed to suit the lifestyle and needs of the family who occupies it. 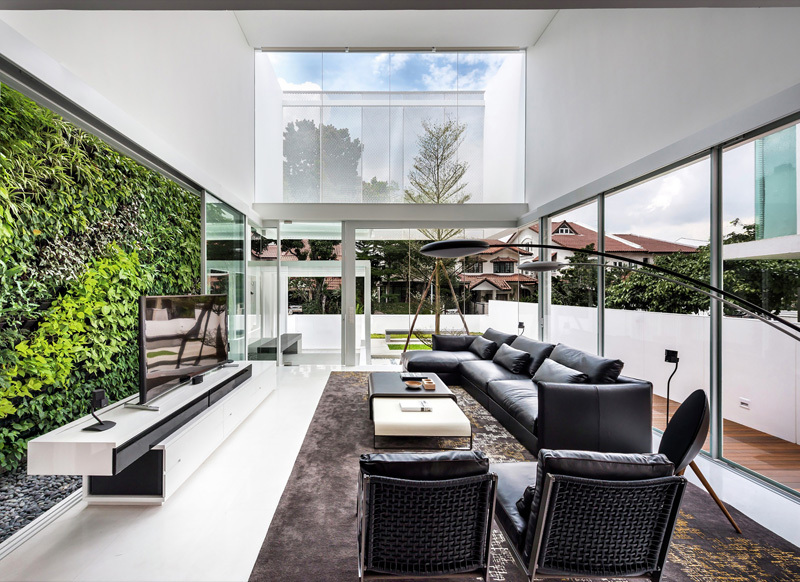 What I like in here is the living wall as well as how airy and bright the interior are. As for the exterior, of course, I fell in love with their “floating box” concept, who won’t be? Now it is your turn to say something about this house. But if you decide to admire this in silence, go ahead and share this to your friends or bookmark it for future reference.